We all know that water is good for us. It clears out toxins, helps the elasticity of the skin, hydrates our bodies, etc. While it is common knowledge that water is important, most of us probably don't hit our daily quota of at least 64 ounces. I know that I have trouble with this. I've come up with a little hack to make it easier to reach, and even go beyond, that target. 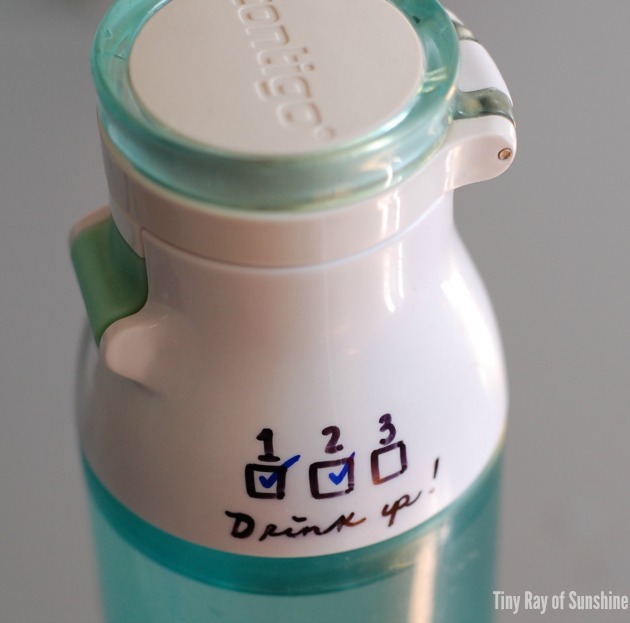 -Grab your water bottle of choice and draw three squares on it with the sharpie. - Throughout the day check off the squares as you drink it. - That's it! That's really all there is to it. Drink and check. - Optional: To make this even more motivating, write an inspiring quote on the water bottle to help you reach your goals. - Bonus tip: If you don't want to draw on your water bottle, another option is to grab a pack of these BevTagz which slip on and off your water bottles. These are also handy if you're using recyclable water bottles. - Extra bonus tip: If you have a silhouette machine or a label maker, you can make this a bit spiffier! I just love tracking things and knowing how much water I'm drinking each day. Refilling this three time amounts to 72 ounces! A whole cup's worth more than the daily suggested amount. With this tiny tip, you'll be well on your way to filling your body with this life-giving fluid. Try not to do it all at once, though. I have tried drinking 64 ounces of water all at once before and it was not pretty. I'm pretty sure I almost exploded. Anyway! Hydrate yo'self!